The first volume of Ambrose's biography of Eisenhower, chiefly on his military career, at least benefited from Ambrose's familiarity with military affairs and his earlier writing on Ike's wartime and postwar roles; if routine, it held together. This second and concluding volume, mainly on the Eisenhower presidency, is again a chronological record--but now of disparate, carry-over developments ("Bricker, McCarthy, Bravo, Vietnam, January 1--May 7, 1954"). 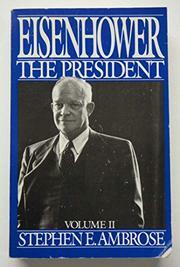 As political history, it's flimsy (Ambrose thinks every president's biggest problem is the military budget); Its thesis that "Eisenhower dominated events," has been more solidly formulated and documented in Robert A. Divine's Eisenhower and the Cold War, more ingeniously presented (at least) in Fred Greenstein's The Hidden-Hand Presidency. But, inherent weaknesses apart, the book is riddled with blunders and bloopers--compounded by uncertain quasi-scholarship. There are personal details that would be eye-blinking, if true: did Eisenhower never so much as put on his own socks? never wear a suit (given him by manufacturers) more than twice? Ambrose doesn't find these particulars odd enough to document. There are supposed achievements for which Eisenhower's memoirs are the only source; worse, Ambrose attributes to Eisenhower-biographer Peter Lyons the opinion that, "without Eisenhower's opposition," the Bricker amendment, limiting the president's treaty-making power, "would have been adopted"--something Lyons neither says nor implies. (Rather, he points up Eisenhower's waverings--and the tie-breaking vote by wily Lyndon Johnson.) Then, confoundingly, there is the matter of Eisenhower's choice of Earl Warren for Chief Justice; never mind that Ambrose is oblivious to the politics involved (it was simply merit, he maintains); Ambrose flatly asserts that "during his Presidency, Eisenhower never doubted that he had. . . made the right choice"--disregarding Ike's famous, oft-repeated gripe that the Warren appointment was "the biggest damfool mistake I ever made." Can Ambrose have forgotten? No: 50 pages later he picks up the subject again, claiming that Eisenhower made such remarks only later, and did not even have such feelings in the White House (on the basis of selective reference to Warren's autobiography--ignoring other parts, and mounds of additional evidence). On the issues, Ambrose doesn't say anything much new either way: Eisenhower erred on McCarthy and civil rights, did well in foreign affairs (unto the Central American interventions). But the book is markedly short of common sense, accuracy, and coherence.